I'm probably not alone when I admit a true affection for nutella. There is something about the luxurious combination of chocolate and hazelnuts that just makes me crazy....it's so delicious. My kids probably aren't alone in that they too love nutella (they've only had it a few times, but it was an instant classic with them). With that said, I don't normally buy nutella. Not just because when it's in my cupboard, I develop an uncontrollable urge to DIP ALL THINGS in nutella (strawberries, marshmallows [hey - don't judge! ], oranges, etc. )...but also because it's really not very good for you. It's full of sugar, scant on nuts and just generally, not a very wholesome thing to eat. It's about as nutritious as chocolate frosting. So I don't have it on regular rotation. Usually what happens is that I buy it to make popsicles (1/3 c nutella, 1 1/3 c milk, blend together and freeze in a popsicle maker...not healthy, but really, really delish). So anyway....to get back on track, I would love to have nutella for breakfast. My kids would also love to have nutella for breakfast. But given that I try to be make sure we eat a mostly healthy diet, I just don't see nutella as an appropriate choice for everyday. So I've got an alternative for you. This is so simple, it barely counts as a recipe. In fact, I don't think it counts as a recipe at all, because it certainly does not take a genius to slap a couple of things on toast. 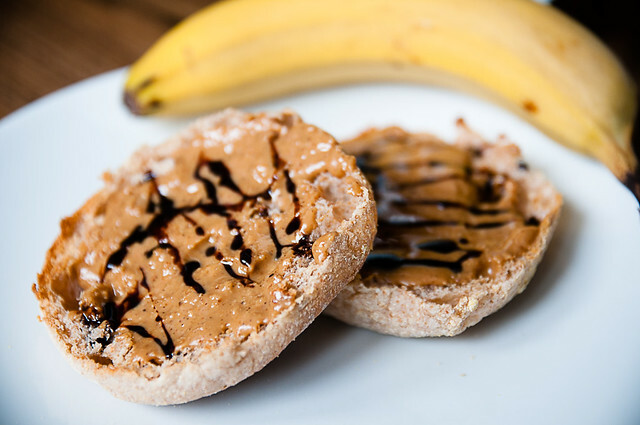 But it's really good, and it (for me and the mini-foodies, at least) completely satisfies the nutella craving, while giving you a breakfast that won't send your blood sugar skyrocketing the way nutella would. The secret is natural hazelnut butter. You might have to hunt for it a bit - I love the stuff from Nuts to You - I can find it at my local Sobeys, but Canadian readers will also be able to purchase it from well.ca. There are a number of manufacturers of hazelnut butter, but the key thing you want to look for is that the ingredients are 100% hazelnuts. I will warn you, it's not cheap (quite a bit more expensive than nutella). But there's a reason for that....this stuff contains 100% hazelnuts, which are not cheap. nutella contains mostly sugar and oil, which are cheap (19g of nutella has 11g of sugar) - it only contains about 13% hazelnuts. 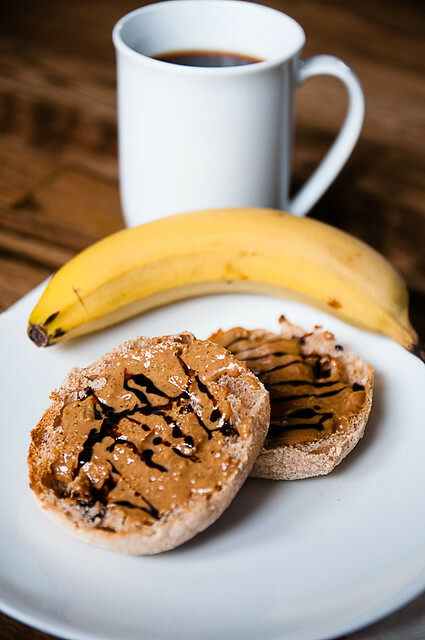 So once you have found hazelnut butter, all you need to do is spread your (whole grain) toast with hazelnut butter, and then drizzle with the tiniest amount of chocolate syrup. A while back, hubs bought some Quik syrup, so I have that on hand, but the important thing is that the syrup be relatively thin, so you can just drizzle a tiny amount. My English muffin (the two pieces together) has 3g of syrup...that's all it took to make me happy and give me a delicious blast of chocolate. If you have a little more time, you could melt a tiny bit of dark chocolate, or even try this recipe for your own homemade chocolate syrup. All that's really important (in terms of keeping it healthy) is that you just need a tiny bit of chocolate - roasted hazelnuts have a wonderful natural sweetness that goes. 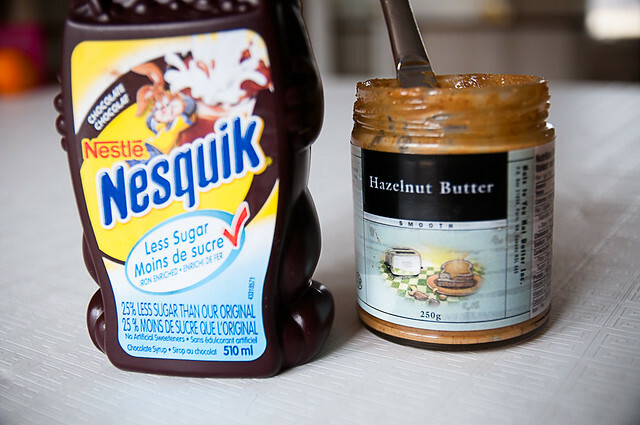 Nutella might make you think you need a lot of sugar, but you really don't. Mini-foodie one also enjoyed hers in a whole wheat tortilla, rolled up with sliced banana. I think it would be even better with strawberries. 1. Toast bread. Add nut butter. Drizzle with syrup. Thanks for reading! 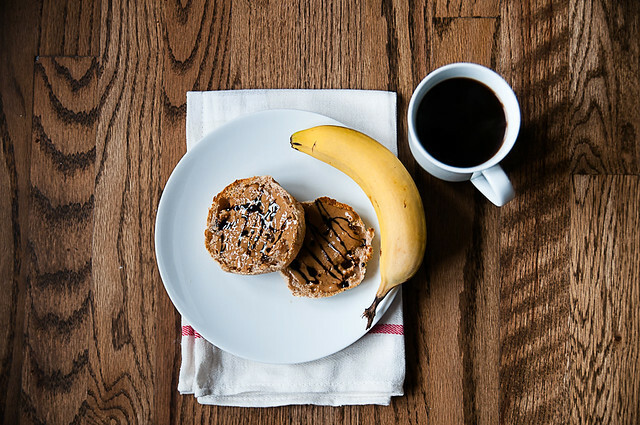 What are your favourite mostly-healthy breakfasts? My new fave is dark chocolate almond butter...not that healthy either but I think a touch better than Nutella. I love the idea of rolling it all up with fruit. Sounds AMAZING! Have you tried overnight oats? My new favourite breakfast! You can always look at the label to compare the sugar! As long as you have a wide variety of foods, where *most* have no sugar, then once in a while it's not too bad! I'm still trying to find a good recipe for overnight oats. I know I don't like steel cut overnight oats so I'm looking for a recipe with old fashioned rolled ones. Do you have a good one?